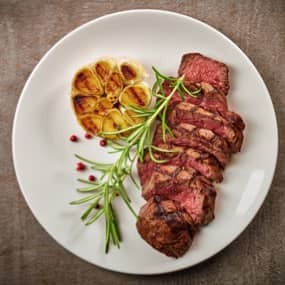 Familiarity with these basic cooking techniques will help you improvise your own recipes and cook with confidence. Here's what we mean when we use the following terms in our product descriptions and recipes. Heat a skillet over medium-high heat until pan is very hot. It shouldn't smoke, but you shouldn't be able to hold your hand 2" away for more than 2 seconds. Add a little bit of fat of your choice – duck fat, chicken schmaltz, olive oil, vegetable oil. Use paper towels to pat the meat dry. Season with salt and pepper on both sides. Place your steaks or chops in the pan -- watch for splatters -- then DON'T TOUCH! Meat will release naturally when a beautiful sear has formed. Resist the urge to "peek" -- this will leave your beautiful sear on your pan, rather than on your meat. Wait 3-5 minutes (depending on the size of meat) before you use tongs to test if the meat will release by pushing it gently side to side. If it is firmly attached, leave it for another minute. Once you feel it starting to release, flip and repeat. 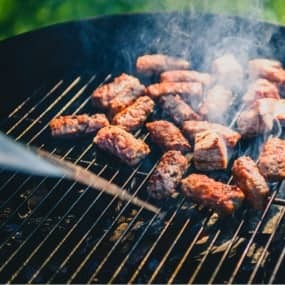 Depending on the size and thickness, you'll either want to finish the meat in the oven, or tent it with aluminum foil and let rest for 10 minutes before serving. Don’t Touch! Checking too early will spoil your sear. Many recipes for roasts or stews will suggest you "brown the meat" before roasting, braising or stewing. They're telling you about the first trick in a chef's arsenal for building flavor in any meat dish: caramelization. 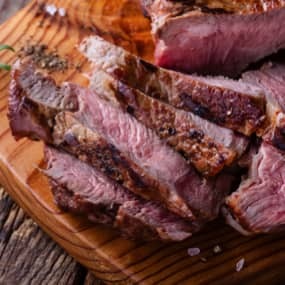 Also called the Maillard reaction, browning occurs when the meat is cooked at a high temperature with a little fat until the color turns a dark brown, your house smells amazing, and the meat releases easily from the pan. Key tips: when browning small pieces of meat, as for stew, don't overcrowd the pan. Work in batches so you don't steam the meat. Also, most importantly, don't rush. 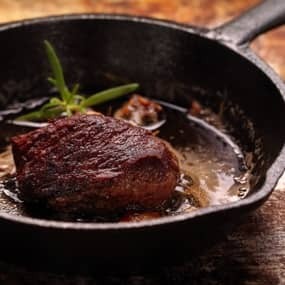 If you try to flip the meat too soon, you'll end up with all the flavor stuck to the bottom of your pan, not your meat. 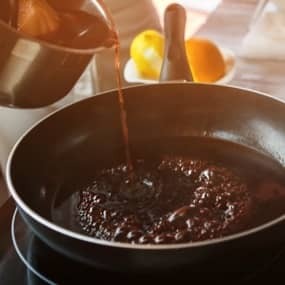 After you've browned all the sides of the meat (adding more fat as necessary – we love to use duck fat when possible), deglaze the pan by adding about 1/4 - 1/2 cup liquid – broth, wine or water – and scraping at the browned bits vigorously until they release (this will produce a lot of steam). The liquid and the bits can be added to your soup or stew, poured in with the braising liquid, or further reduced to make a pan sauce. Don't forget to scrape up all the browned bits to add maximum flavor to your dish! 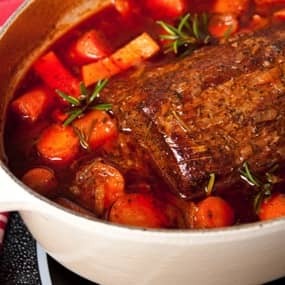 Braising is a technique for cooking meats with liquid at a low temperature. 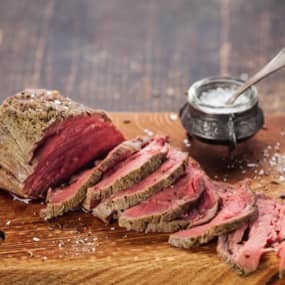 It is especially helpful for cuts with lots of collagen or connective tissue that would be tough if cooked at a high temperature, but when allowed to render slowly, produce a silky-smooth, juicy and well-basted roast. We recommend this for some beef, lamb and rose veal roasts, but it's also a great for poultry legs and thighs that can benefit from a longer cooking time. The basic idea is this: Brown the meat. Place meat in a roasting pan with sides at least 3", or a taller pot like a Dutch oven. Add liquid up to about one third or one half of the way up the meat (less for poultry, more for beef roasts like Kalakel). This liquid could be water, broth, wine (or a combination), and may be enhanced with a quartered onion, some fresh herbs, whole garlic cloves, or even slices of fennel or citrus for poultry. Cover the pan tightly with a lid or aluminum foil. Cook at 300F for approximately 1-6 hours until the meat is tender. It will be done much sooner, but still tough. After a while, you'll start to feel the meat loosening up. 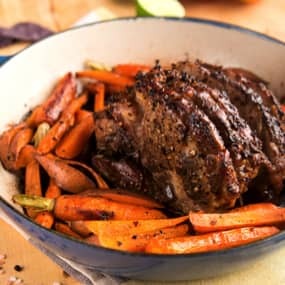 For a beef roast such as brisket, cooking it until it is tender but still firm will allow you to slice it; cook it longer if you want to make pulled or shredded brisket. "Low and slow" is the name of the game for many delicious roasts. Don't rush it. Tender roasts and poultry can be cooked at higher temperatures until they reach a specific internal temperature indicating doneness. The key thing to remember is that temperature will continue to rise about 10F after the meat comes out of the oven, so take it out when it is about 10F lower than your desired temperature. Add flavor to your roast with a combination of the following: fat (chicken schmaltz, duck fat or olive oil), salt + pepper, crushed garlic, chopped fresh herbs, dried herbs, citrus zest. Allow your roast to rest at least 10 minutes before slicing for the juices to fully absorb into the meat. If you want to cut thin slices, cool to room temperature first. This is a technique for gas or charcoal grills, but can also be simulated in an oven. After meat is seared over high heat, it is then moved over to a cooler part of the grill to continue cooking. On a gas grill, set one half of the burners on high and the other half on medium low. On a charcoal grill, pile briquettes or charcoal on one half of the kettle. Sear meat over the high heat, then transfer to the other side to continue cooking to desired internal temperature or level of doneness (ie, steaks), or until meat is tender (for chicken on the bone and ribs). Bank the coals on one side of your grill. Here, the chicken wings are hanging out on the cool side after being seared, to allow the meat to soften and finish cooking. Brining is critical for cuts that are hot roasted or grilled, like chops, rack of veal, or shoulder roast. 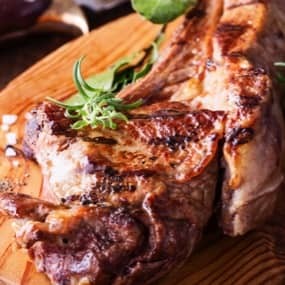 Don't be intimidated, brining is actually quite easy and makes your veal chops significantly more tender, succulent, and much more forgiving of overcooking. Make enough brine to cover your meat. The volume of liquid needed depends on the vessel you are using, but the only important thing is that the meat is submerged and the weight of salt is correct. When we refer to a "X percent brine", we are talking about the percentage of salt, by weight, relative to the amount of water. For a 3.5% brine, use 35g salt in 1L water. For 5% brine, use 50g salt in 1L water. (We like a 3.5% brine, but if you like your meat a bit saltier, you can go up to 5%.) You can add other flavorings to the brine such as spices, herbs, or sweeteners. For smaller cuts like chops, you'll want to brine about 8 hours. For a large whole muscle roast, you'll want to brine 12-16 hours. You should brine the meat in the fridge. After brining, remove the meat from the liquid and discard the brine, then pat the meat dry with a paper towel. Rose Veal is lean. A good soak in a brine helps to keep it from drying out when cooked over high heat. Kosher meat is salted as part of the kashering process. 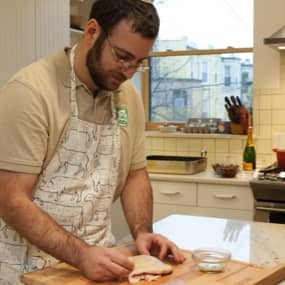 In general, we omit salt from non-kosher recipes when cooking, then add it at the table. A sprinkling of coarse sea salt can do amazing things for a ribsteak or lamb chops! We don’t generally recommend brining turkeys, although we do have instructions for how to modify non-kosher recipes so that your bird isn’t overly salty. The one exception is brining Rose Veal. Soaking in a salt solution helps to tenderize the meat, and does not make it overly salty. 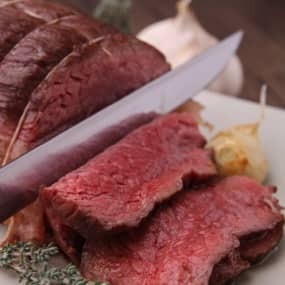 If you are especially sensitive to salt, avoid Skirt Steak and/or soak it in 2-3 changes of cold water for 30 minutes to remove salt from the kashering process. Heat poultry skin or cubes of fat over very low heat in a large skillet (or, if you're rendering a large amount of beef fat, use a Dutch oven or high-sided saucepan). You can add a little water to the pan, and keep the flame quite low to prevent browning. Fat will render out and collect in the pan -- bits of meat and skin will start to crisp. 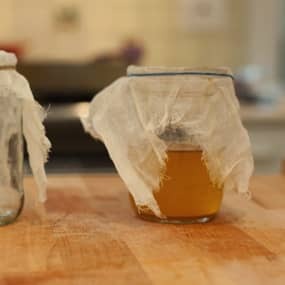 Pour off the fat periodically into a fat separator or clean jar covered with cheese cloth to remove the solids. You may need to lower the heat as the pan warms up to prevent browning. Store rendered fat in an airtight container in the fridge for 1 month or freezer for 3 months. Strain fat through a cheese cloth to remove any particles. The cleaner the fat, the longer you can store it in the fridge. Our high quality meats need little more than salt, pepper, olive oil and a good pan to make them sing. That said, we've learned a few tricks that will help ensure you have fantastic results. 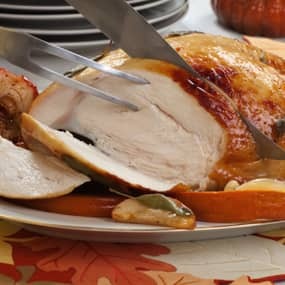 Pastured Chicken does best cooked low and slow: try roasting at 300F for 60-90 minutes, until meat is tender and bones feel loose (white meat should be removed from the oven a bit earlier). 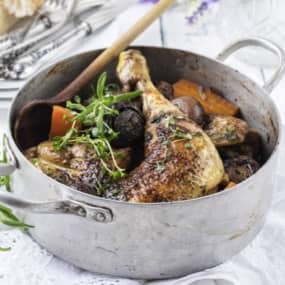 Dark meat cooked on its own (Leg Quarters, Thighs and Drumsticks) are best cooked at lower temperatures (300-325F) with some braising liquid. Again, cook time may be longer than what you're used to -- the last 20 minutes or so is not so much to ensure they are cooked but that they are tender and melting off the bone. You can also roast them without liquid in a low oven (~275-300F) until tender. Duck is a rich meat with incredible flavor in its fat. It's best to remove that fat while cooking and save it for another use (slathering on potatoes, etc.). To do this, prick the skin of the duck with a push pin, or score it lightly with a sharp knife, taking care not to cut all the way through. For breasts, sear in a pan and drain off the fat as it accumulates; pour through cheesecloth into a jar and save. For whole birds, roast in a deep casserole and pour off the fat every 30 minutes or so. Duck pairs nicely with sweet fruity flavors like Apricot, Lavender, Chinese 5-Spice Powder. Pastured Turkey is leaner than conventional turkey and cooks much faster. Allow 10-12 minutes per pound. Also note that flesh may be pink even when bird is fully cooked. Use a thermometer to gauge doneness and remember that internal temperature will continue to rise 10F after it comes out of the oven. The best way to cook a steak is on a charcoal grill using direct and indirect heat. Sear on the hot side of your grill, then move to the cooler half to continue cooking. You can accomplish this on a gas grill by simply turning one half of the burners to low. Indoors, use a heavy cast iron skillet to sear the steak, then transfer to a preheated oven (350-400F) to finish. It's easy to overcook in the oven, so check frequently and remember to use an oven mitt on the handle! Tent the steaks lightly with foil (so steam can escape) and let rest 10-15 minutes before serving. The first thing to check is whether your roast should be cooked at high temperature with a dry rub, or at a low temperature in liquid. For high heat roasts, remember temperature will continue to rise 10F after the roast comes out of the oven. Don't overcook! For braising roasts, the meat will be done after an hour or so, but very tough. Continued cooking for 2-3 more hours will allow the collagen to render and the meat to become fall apart tender. Our Rose Veal is much leaner than conventional confined veal. As such, take care not to overcook it. Rose Veal benefits immensely from a simple saltwater brine for 6-8hrs. Brine it in the morning, cook it that night.